Bulk pack for orders of 10 or more units. For orders of less than 10 units, please see our DIY tee page. A great cost-effective solution for your next event or promotion. Price includes a full colour print (up to 280x400mm in size) on the front of a standard white unisex tee. Includes children's sizes, so a great option for clubs with a big age range, or family events. 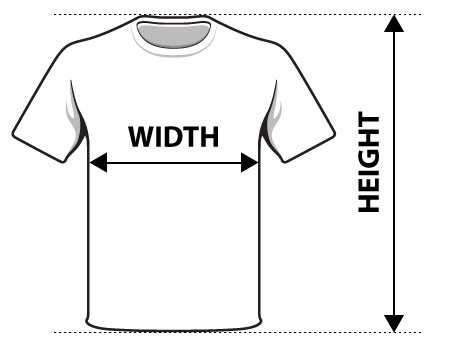 Simply upload your design, and add your required sizes to the cart. You only need to upload your file once. When your cart totals 10 or more items, checkout will be enabled. You can mix and match sizes, for example, an order of 5 x large and 5 x medium would qualify. Note: Please ensure you have permission to print any files / images / artwork you upload. It is illegal to take other people's stuff without asking, so please don't pinch stuff and use it on our site :) If you are not sure about the copyright issues of the file you want to use, please contact us and we can advise you.